Brian Stork, prosecuting, told the jury that Dappy, 25, charged under his real name of Costadinos Contostavlos, pulled up in a car at the Shell garage in Woodbridge Road, Guildford, Surrey at about 3.30am on February 28 last year. He and a friend Kalonji Stewart got out of the car along with a third man. While Stewart went inside the shop Dappy began talking to the girls, Grace Cochran and Serena Burton, who were in a group sitting on the kerb outside. Mr Stork alleged that Dappy tried to persuade the two girls to come with them in their car and when they refused he called the girls sluts, said one was ugly and then spat at them, but missed. A man who just met the two girls, David Jenkins, stood up to defend them and Dappy is said to have spat at him and it made contact before swinging a punch at him and, the barrister told the court, "it all kicked off". 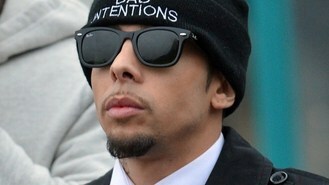 In the resulting "mob-handed, utterly unlawful and aggressive attack", Dappy was joined by two other men, Kieran Vassell and Alfred Miller who had arrived in a second Mercedes car with other unidentified men. Mr Stork showed the jury CCTV footage, lasting just moments, from the garage. It showed the men attacking Mr Jenkins and his two other friends, resulting in damaged teeth to Mr Jenkins and a fractured nose to another man. The singer is standing trial at Guildford Crown Court and denies two counts of common assault on the two women, one of assault by beating, of Mr Jenkins, and one of affray. He is charged alongside Vassell and Stewart, who are each charged with affray. Miller has pleaded guilty to affray and his case was adjourned for sentence at the end of the trial. In a police interview Dappy said he went over to the girls and told them his new single with Queen guitarist Brian May called Rock Star was out and that they had been rude. "Someone put me aggressively into a head lock and then my security turned up to get him off of me and that was it. I was put straight into a car after that."